Dimensions (HxWxD): 1.375" x 1" x 0.25"
This beautiful Amethyst accented Clear Quartz Star of David Pendant with a Rose de France Amethyst Super Nova accent stone is of exceptional quality, both in the cut of the stone and in the simple silver band setting which allows the stone to breath and function at its highest vibration. It comes with an 18" sterling silver chain which sits upon the thymus bringing maximum benefit of the stone to the wearer. The accent stone is a modified Millennium Cut, a starburst pattern that was created in the early years of the 21st Century by master jewelers to reflect the emerging consciousness of a new millennium. They've named it a Super Nova! 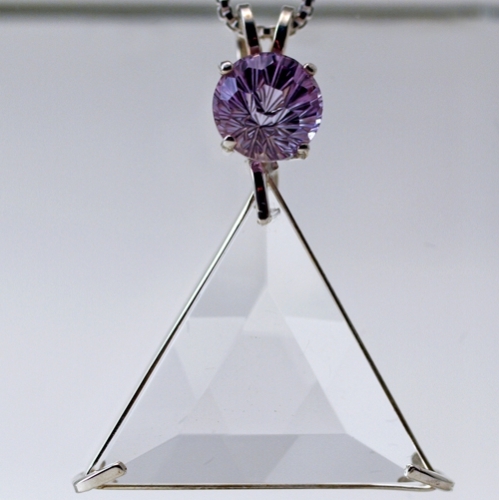 This Rose de France Amethyst accent stone is 8 mm, a true treasure! The surface of the Rose de France Amethyst Gemstone is laced with an intricate pattern of flat hexagons, like a honeycomb or the eye of a honeybee. The compound eye of a honeybee consists of an array of hexagonal visual sensors designed to maximize the honeybee's ability to detect tiny movements in shadow and in the lower, infrared light frequencies, enabling the honeybee to achieve maximum awareness of predator movements in deep shadow and also provides amazingly acute peripheral vision. Note: Weight above is shipping weight. Average weight is 9 grams. Each piece is unique and may vary slightly in appearance and dimensions from photos. Each piece is beautiful and guaranteed to meet with your complete satisfaction!